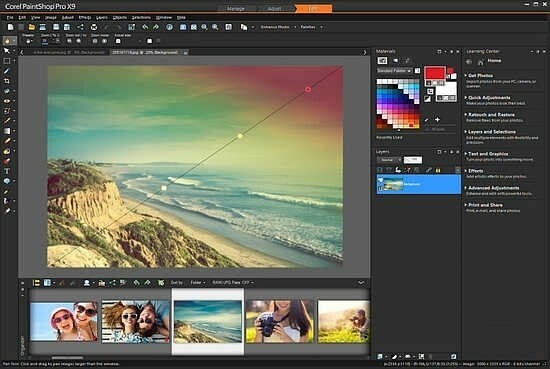 PaintShop Pro is arguably the closest competitor to Adobe Photoshop, and it's been around for almost as long. Its image editing capabilities rival those in Photoshop, yet Corel is keen for PaintShop Pro not to be an intimidating experience, so it’s chock full of hints, tips and guides to aid the learning process. But perhaps the most attractive feature of PaintShop Pro over Photoshop is pricing, as version X9 can be had for a one-off cost of $79.99 / €69.99 / £59.99, with no need to commit to a monthly subscription plan like Adobe Creative Cloud. After installing PaintShop Pro, you're first greeted by a helpful guided tour that introduces you to the layout and integral interface features of the software. 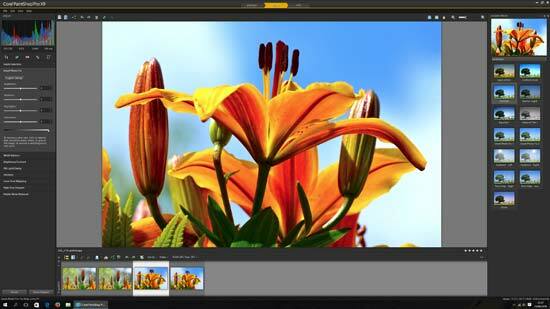 The most fundamental of which are PaintShop Pro's three main workspaces: Manage, Adjust, and Edit. 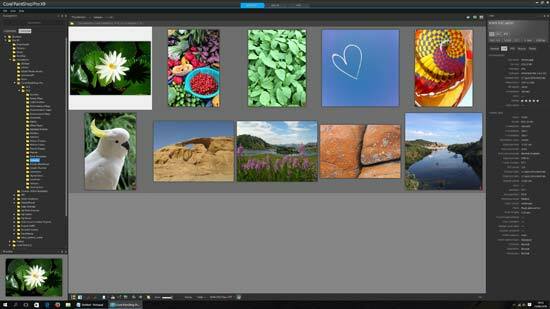 These mirror Adobe's Bridge, Lightroom, and Photoshop, but Corel groups them in a single window for tighter integration. Manage is – you've guessed it – an image management app, for organising, examining and tagging your shots. You get the usual folder tree pane on the left of screen, an image thumbnail display in the middle, and detailed image info like EXIF data on the right. Organisation options include manual image tagging, as well as funkier features like automatic face recognition to categorise images by friends and family members. 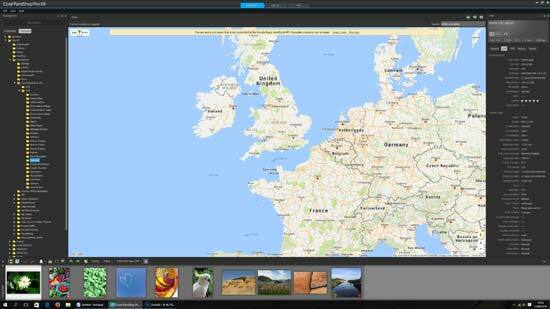 Images can also be tagged and grouped by location using Map View. Image sharing is incorporated into the Manage workspace, with options to share shots straight to Facebook, Flickr and Google+. An additional Share My Trip option works in conjunction with Map View location tagging, sharing your holiday snaps to Facebook with location information attached. Once you've culled and organised a shoot, it's time to tweak. Quick edits can be made using the Adjust workspace, which contains common image enhancements displayed in a more user-friendly interface than the full-blown Edit workspace. 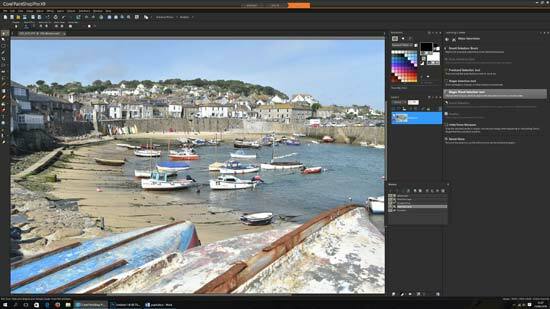 On the left of the familiar image preview are quick-fix adjustment sliders to tweak things like brightness, contrast, vibrancy and white balance, as well as remove image noise and even apply tone mapping to create a single-image HDR effect. You'll also find crop and image straightening tools in this pallet, with the latter making it extremely easy to level a wonky horizon. PaintShop Pro's Adjust workspace even gives you portrait enhancement features in its Makeover section, with one-click red-eye removal, a tool to remove spots and blemishes, options to whiten teeth, fix bloodshot eyes and tan skin, plus a questionably-titled tool called Thinify to slim your subject. If you'd rather add an instant effect filter to your image, there are 100 of them selectable from the pallet to the right of Adjust's image preview. These are grouped into themes such as Landscape, Portrait, and Retro, and as is often the case with filter effects, some look more attractive than others. Their usefulness is further reduced by an inability customise the intensity of each filter, though you can create a new filter preset to quickly recall a procedure of individual edits. Even so, PaintShop Pro’s filter effects seems somewhat of a half-baked token attempt, included mainly to compete with the more versatile filter offerings in software like On1 Perfect Photo Suite or DxO FilmPack. But in fairness to PaintShop Pro, filter effects aren't what the software is most renowned for. Both the Manage and Adjust workspaces are really warm-up acts for the main event: the Edit workspace. 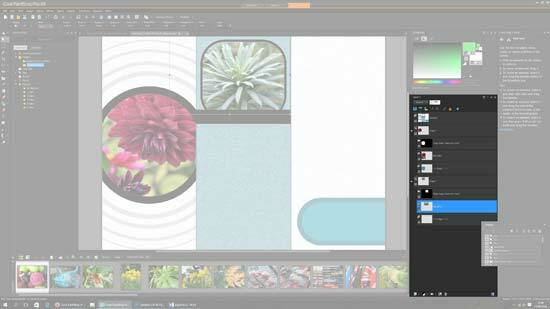 This is a full-on, Photoshop-rivalling editing app with a similar interface design. But while Photoshop can be daunting for novice users, Corel has attempted to make the Edit workspace more accessible, with a Learning Centre pallet on the far right of the window that can be navigated to discover different tools, which in turn are highlighted in their respective toolbar and are accompanied by a guide on how they work. 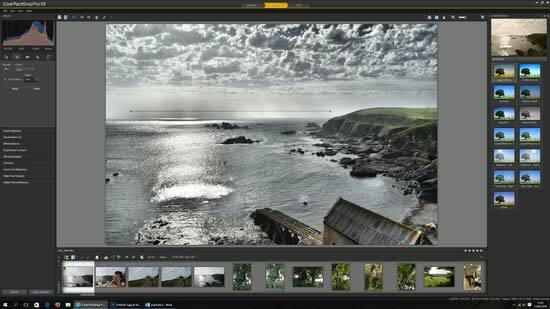 Common Edit tools include the crop and straighten functions from the Adjust workspace, and the latter is supplemented by a powerful perspective correction tool. 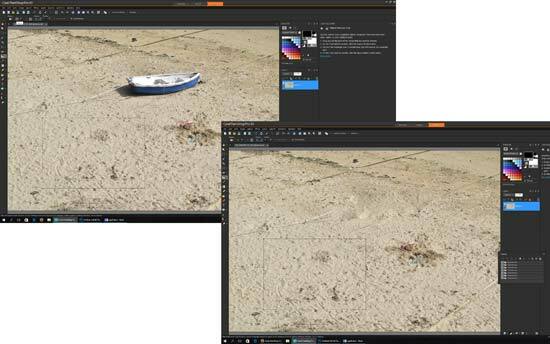 Removing unwanted objects in frame is also easy in PaintShop Pro, with a Clone tool, Smart Selection Brush, and Auto Selection. There’s also a clever Content-aware Magic Move feature that debuted in version X9. When moving an element within an image, the software will automatically clone the blank space left behind with surrounding texture. 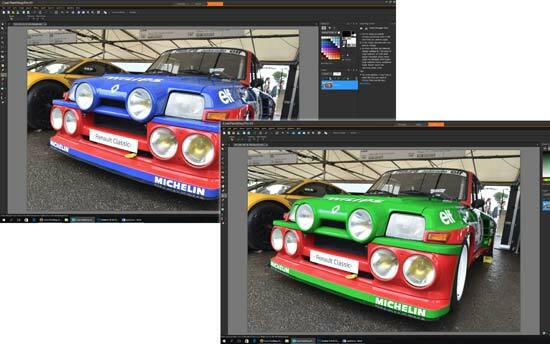 As is always the way with content-aware cloning though, this feature works best when dealing with large surrounding areas of uniform colour or texture. Another similar cloning feature is the Object Removal tool, whereby you select and delete and unwanted object, then manually define an area of background you'd like to use to fill the space left behind. PaintShop Pro then pastes this in the object's place. Other useful features include the Color Changer tool for switching an objects colour while preserving its tone and texture, which can be likened to the Photoshop's Replace Color function. You also get a Pen tool for making custom shapes and vector graphics, and there’s a pixel warping/manipulator feature akin to Photoshop Liquify. 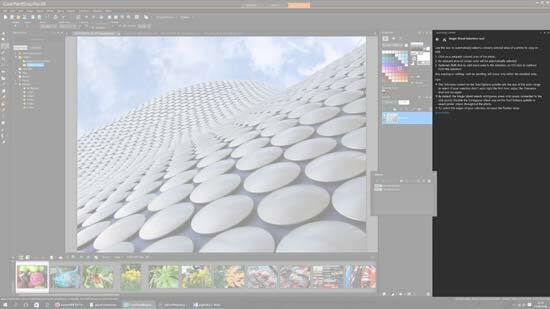 Possibly PaintShop Pro’s most powerful feature is its fully layered workflow, which features the main layer style, blending, and masking options that you’d find in Photoshop. This alone gives PaintShop Pro a real edge over other image editing packages that include little if any selective editing capability, even surpassing the useful but limited Control Point system in Google’s Nik Collection.